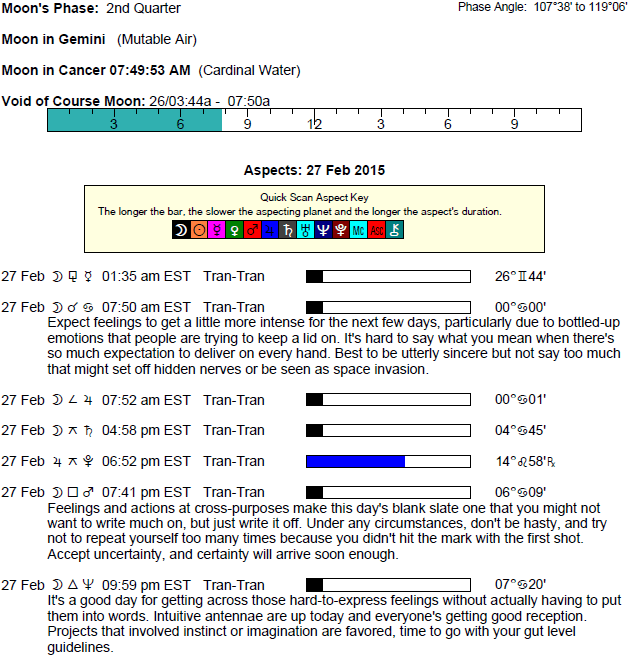 The Moon moves out of a lengthy void period and into Cancer this morning. We are more inclined to want to take action than to think things through, but we’re also far more aware of our feelings. 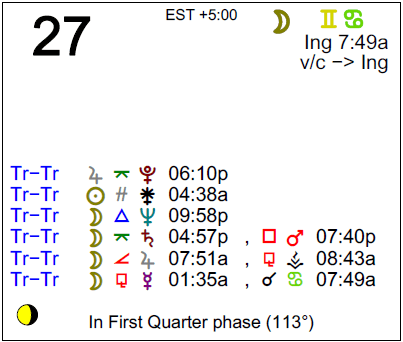 A Jupiter-Pluto quincunx that first formed in September comes exact again today, and some of the themes we encountered then surrounding over-estimation or over-extension can return now. The Moon is in Gemini until 7:49 AM. The Moon is void until 7:49 AM (since yesterday at 3:43 AM). The Moon is in Cancer from 7:49 AM forward (until Sunday, March 1st, at 6:34 PM). If there has been too much emphasis on leisure activities or romance recently, dear Aries, then you may be suffering the consequences now, or you could simply decide that you need to get to a better place of balance. Jupiter in awkward angle to Pluto, an influence that occurred in early September, is exact again now, and themes are reiterated. Responsibilities to career and other obligations can be daunting now. There can be a moral dilemma involving your career, or you could realize that in order to advance, you need to make sweeping changes. Don’t feel pressured to do so quickly, and instead aim to pace yourself. This is not an ideal few days for attempting to force your will. There can be an almost obsessive quality to your focus on problems of the past or on work and reputation problems. A past mistake or area of neglect can become obvious now, and while a solution may seem difficult to find, aim to avoid letting these things deter you from your path. If attention to home and family has been excessive lately, dear Taurus, you could be feeling the consequences around now with a Jupiter-Pluto aspect that first occurred in September and is now exact again. There could be a need to get away from it all, or for attention to studies, and avoiding or escaping responsibilities has been a temptation. Delays, distractions, and interference can occur now that alert you to the need to make adjustments or personal sacrifices. Long term goals might once again come up for revision. There could be a small but tricky moral dilemma involving family and belief systems, or for some of you, in-laws! 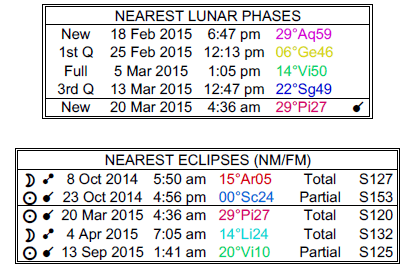 The Moon’s move into your communications zone this morning is pleasant, although busy. You are more inclined to reach out and connect with others now. While you can be especially enthusiastic about learning and connecting these days, dear Gemini, there can be times when you go to excess, whether it’s defending an idea or getting worked up about something that hasn’t happened yet, and may never transpire. Taking on too many daily activities, communications, new interests, and learning endeavors or studies should be nipped in the bud now. Watch that you don’t overestimate your abilities by piling on more projects than you can handle. Also watch for overly provocative communications now. Focus on long-range plans. Changes may need to be made in your approach, and past mistakes may surface, in need of attention. You may have dealt with similar issues last September, when this aspect first formed. The Moon moves out of your sign this morning, and this can act to steady your emotions. You could be staunchly defending something or someone these days, but today, dear Cancer, there can be some reason to doubt your convictions. Toning things down tends to help you gain more support. You don’t usually need to be reminded to be gentle! However, you could be feeling so passionate these days that you forget; and some of you just aren’t bothered if you’re rocking the boat. If you’ve been overspending or excessive in the material world, circumstances now and this week can push you to find more balance. Challenges in partnerships may be magnified. You may have reason to question an idea, value, belief system, or even a person now. This is a time for making adjustments, not jumping to conclusions, so do yourself a favor and take some time to process new information now. This influence first occurred in September and is now coming exact again. The Moon enters your sign this morning, bringing previously buried feelings to the surface for your immediate attention. Distractions may be plenty regardless of your motivation these days, dear Leo, with a Jupiter-Pluto influence that first formed in September and that is exact again today. Themes from then can come into focus again now. You can help yourself by prioritizing, but keep in mind that you may be overshooting or expecting too much from yourself. You might experience extra sensitivity to off or funky power dynamics in your close relationships, and for some of you, there could be some minor health complaints that are holding you back right now. There can be some self-doubt or questions about your current alliances, goals, or path. There is no need to jump into making decisions – if you’ve been overdoing things or expecting too much, make some adjustments and get back on track. The Moon moves into your privacy sector this morning, making it an ideal time for contemplation. There can be some frustration now if you feel that some of your plans are not coming together as you had expected, dear Virgo. Consider, however, that you may be perceiving a situation in such a way that you feel pressured to push forward when in fact you do have more time than you think! Pushing does not work right now – the cosmos are demanding a checkpoint adjustment which will be similar to a theme you first encountered in early September. A significant person could be trying hard to get an answer from you about a past matter. Someone’s secret can affect you negatively, or something could be used against you. Insecurities are emotionalizing the facts, so wait things out. Keep in mind that everything has to be aboveboard right now to be supportive of your growth, and it’s wise to aim to rid yourself of things that are weighing you down. The Moon enters your friendship and goals sector this morning – a pleasant place for the Moon. You might benefit from some emotional detachment now. A friend or family member might frustrate you today, dear Libra, especially if they’re distracting you from what you want to do. Or, there can be a dilemma between attention to family and attention to your outside commitments and friendships. There may be difficulties with a family member who is at odds with the energy and time you are pouring into your friendships and causes, for example. Thinking fluctuates today so that the messages you are trying to convey may not be received as you intend. Knowing your heart’s desire can make it much easier to ask for it, and to be heard exactly as you want to be heard. Worrying about mistakes you’ve made can also figure strongly today. This is a time for attempting to balance things out, especially in areas that have suffered due to excesses in other life departments. This influence first occurred last September, and will return in coming May. The Moon enters your reputation sector this morning, and you are inclined to put emotions aside in order to take care of business. While you are generally carrying yourself well, dear Scorpio, you can be conflicted on the inside right now. These days, on a grand scale, you are projecting yourself as approachable and warm, and this certainly attracts positive, supportive circumstances and people into your life. Right now, however, there can be discomfort with the status quo and this might lead you to take on too much, or to chase after impractical goals. The cosmos are now asking you to make adjustments in order to restore some balance. This influence first occurred in early September and is now in focus again. Changes revolving around attitudes and styles of communication may be necessary now. There can be a temporary feeling that you don’t have much control over what people know about you, for example. There could be a moral dilemma connected with your career. Aim to get in touch with your fears and insecurities, as this will help you to eventually make good decisions, but don’t let them rule your day. The Moon’s presence in your adventure sector from this morning forward helps you to gain perspective. The cosmos are asking you to slow down a little in order to make adjustments right now, dear Sagittarius. Controlling recent excesses may be required now in order to get you back on track, due to a Jupiter-Pluto connection that ties your adventure and resources sector together in an awkward way. This influence first occurred in September, and is exact again today. This is especially the case if you’ve been spending too much time away from your daily responsibilities. Remind yourself that strength is in moderation. When it comes to self-expression, it could be difficult to express exactly what you mean. Explaining yourself can somehow take you further away from communicating your inner message! You might decide to wait to address important issues until you are clearer. Fears can be magnified today, particularly surrounding finances and possessions, and you may be questioning your beliefs or perspective. There may be a moral dilemma to deal with with business or money. Jupiter and Pluto are forming a challenging aspect today, dear Capricorn. This first occurred in September and is exact again now, bringing back themes of excess and the need for adjustment. Watch for over-estimation of your capabilities. This is a time when recent excesses or overshooting tend to catch up with you. When it comes to recent plans, you may need to choose a different route, or simply take the pressure off to do too much, too fast. You can realize now that changes in your outlook and attitude need to be made in order for you to grow and improve. It’s important that you try to control a tendency to dwell on negative or difficult situations, as this can drag you down. You need to watch for taking on too much debt or relying too heavily on others, and you should use some discretion when communicating about intimate or personal matters. The Moon moves into your partnership sector this morning, bringing your attention to close relationships and also balance in your life in general. You are looking for more harmony now. If you’ve been entertaining false images of yourself, dear Aquarius, this is a time when you begin to wonder if what you’ve been seeing has any weight in reality. You may be doubting your alliances, a relationship, or your own perceptions, which ultimately leads you to reassess what you stand for. Try to take a break from pushing plans forward. You may be rushing something, and you should let your “insides” catch up with your actions. Others may be bringing up the past and could be unwilling to move forward, just for now due to a Jupiter-Pluto influence that first formed last September and that is exact again today. You can find yourself returning to issues that first occurred then. Aim to make adjustments. Watch for guilty feelings and make it a goal to take care of matters that will alleviate them. The Moon moves into your health and work sector this morning, bringing your attention to your daily affairs and routines. Overload or the magnification of problems surrounding work or health can be experienced now, dear Pisces, with Jupiter in your service sector in awkward angle to Pluto in your friendship and goals sector. This influence first occurred last September, and comes into focus again now. There could be vague health concerns, or there could be a waning of motivation, energy, or drive. It may seem to take more time or energy to accomplish tasks that you typically handle more easily or quickly. While you would love to push ahead, it’s important to take the time to realign and redirect your energies, as this will benefit you most down the road. You could be engaged in repetitive behaviors and activities, possibly in order to get something just right, but watch that you don’t take this too far. A moral dilemma involving work and friendships could surface. The Moon moving into your romance and creativity sector this morning can help improve your mood. You need to express and share in order to release your emotions effectively. 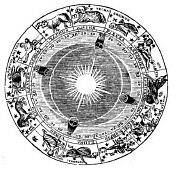 If Your Birthday is February 27th, If Today is Your Birthday full horoscope here. You can move mountains in order to achieve aims and objectives. Act with integrity. Avoid manipulative games, either your own or others’. You are cautious about trying new things, and need to take a few risks. You shine in the public arena. Profession, social status and marital status become the lens through which you will express yourself. Cnj 22°Sg39 RAS ALHAGUE The desire to heal a wound. Moon 05° Capricorn 46' 21"